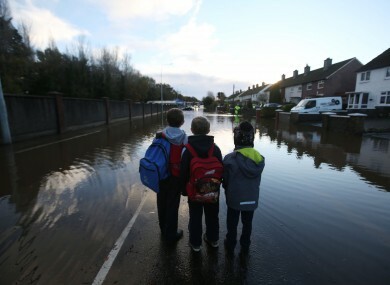 Children look at flood water on Nutgrove Avenue in Dublin on their way to school on Friday. 509,000,000km: The distance between Earth and the comet which the robot probe Philae successfully landed on during the week. €17 million: The amount that a gold watch was sold for in Switzerland on Tuesday. 12.5 million: The number of people worldwide who pay for Spotify, which has a total of 50 million active users. €3.5 million: The amount of money that Ulster Bank was fined by the Central Bank this week for its IT problem in 2012 which affected hundreds of thousands of customers. 325,000: The number of meals two young entrepreneurs have saved from the rubbish by asking supermarkets to donate their food waste to charity instead. €38,000: The amount it costs to breed, train and maintain a guide dog. 34,000: The number of people who should have had their fingerprints taken by gardaí over the past two years, but didn’t. The figure was contained in the damning Garda Inspectorate report this week. €4,700: The average amount of extra money people will pay for a house that is located close to a primary school. 430: The number of pages in the Fifa report which cleared Qatar of any wrong-doing in the 2022 World Cup bid process, meaning the tournament will go ahead as planned. 69: The number of cast members in internet sensation Too Many Cooks. 36: The number of hours the New York Times spent in Dublin. 19: The number of years that a serious flaw existed in Windows products before it was discovered earlier this year. 4: The number of rainfall warnings issued by Met Éireann this week. 1: The number of women who made the 10-strong shortlist for Fifa’s world football goal of the year. Stephanie Roche is nominated alongside household names for her wondergoal while playing for Peamount United. Email “House prices, Too Many Cooks, and Stephanie Roche: The week in numbers”. Feedback on “House prices, Too Many Cooks, and Stephanie Roche: The week in numbers”.